Performed on visible teeth in the mouth under local anesthesia (the tooth is loosened from its socket and then removed with dental forceps). A more complicated procedure for teeth that are badly broken down and cannot be removed without surgery. After extraction, bite on a gauze pack for 30 to 60 minutes to arrest bleeding from the tooth socket. Meanwhile you should swallow the saliva normally. In order to avoid bleeding from the socket again, the blood clot in it should not be touched or disturbed. If there is profuse wound bleeding, you should immediately see your dentist depends on the bleeding severity, or seek for emergency care in the A&E of the nearby hospitals. 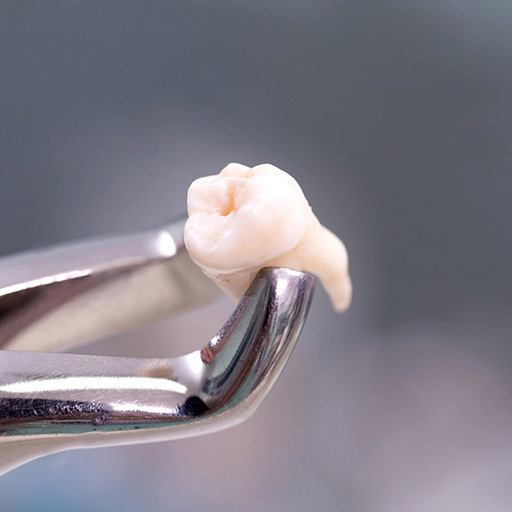 As the tissues around the extraction site will be numb for some time, to avoid hurting them, do not bite or unduly touch those areas within 3 hours. It is normal to have some swelling at the wound, and it will subside in a few days. You may follow the dentist’s instruction to take the medication or use cold pack to relieve it. Take the medication as instructed. As food debris would trap in the tooth socket on the following days, you should rinse the mouth with lukewarm water or saline after eating in order to keep the wound clean.